Wow that was SO much fun. What a thrill to be on the Tom Woods show! He really is one of my favorite, if not actually my #1 favorite libertarian speaker. He is a scathing but light-hearted and hilarious cynic, with a biting sarcasm and wit possibly even more scathing than my own. He just does it better than me I think and with more poise, while I am more spastic and emotional. He can destroy any statist argument in seconds and he is entertaining as anything. Here is Tom at his best. I loved this talk. There aren’t too many countries created from scratch before our eyes, so that historical episode raises important and interesting questions, for libertarians in particular. Arguing in the affirmative: Rafi Farber. Arguing in the negative: Jeremy R. Hammond. The episode is already recorded, so I can tell you: this topic is debated in a manner that is at once civil, engaging, and informative. I decided to host a debate on the topic when I discovered that Walter Block and the late Murray Rothbard, two Jewish libertarians, disagreed on the issue. So I thought we ought to hash it out and see what conclusions we can reach. Now you’ll never guess: on Twitter, someone demanded to know why I was allowing a debate on the legitimacy of the state of Israel. Why not Germany, England, France, etc.? I found the question obtuse. How about because major libertarians disagree, and it’s good to try to resolve disagreements? Or how about the significance for current events of the circumstances surrounding the creation of Israel? Only if we understand Israel’s birth correctly can we form correct judgments about ongoing events in our own day. I’m not sure exactly how well I performed because I haven’t actually heard it yet, and you people in the US will probably hear it before me because it will be Shabbos here in Israel by the time it’s online. But I believe I did very well, at least in my own head. I dug in there with my Jewish claws so to speak and didn’t let go, and spoke from the soul about Rome, Har Habayit (the Temple Mount), Ma’arat Hamachpela (Cave of the Patriarchs), the expulsion from Gush Katif (Gazan Jewish settlements) and other topics. I also made a request of Tom personally as a Catholic libertarian at the end of the debate which you will hopefully hear, and I am serious about the request. It has to do with the Vatican and some stuff they have. I have to commend Jeremy for a respectful debate. I believe he and I made history here, along with Tom, in conducting this discussion civilly. You’ll hear in the debate that we actually agree on much of the practical solutions to this conflict, which happen to be very similar to the solutions of Moshe Feiglin. No Jeremy and those that agree with him generally will not turn into Feiglinites any time soon, that I’m certain of. But on principle, paying the Christian and Muslim Judeans to leave voluntarily (and with that nomenclature I’m giving you a small hint of the direction of my argument) is a solution that Jeremy did not object to on principle if the non Jewish people now living in Israel so desire to leave for money. I believe they do. So let’s get it done. Enjoy the show! You’ll find it here some time today. I will link to it on Motzash. Why are so many Jewish libertarians uncomfortable with their Jewishness? I just encountered your website, it looks most interesting. I was curious as to whether you have explored the issue of why so may Jewish libertarians/anarcho-capitalists are uncomfortable with their Jewishness. Two prominent examples would be Ayn Rand (even though she eschewed the libertarian label) and Murray Rothbard. One example of Rand’s refusal to confront her Jewish origins was her treatment of the Kira character in We the Living. The novel’s protagonists was by Rand’s description largely autobiographical, yet she was Russian Orthodox, not Jewish. Rand was able to bravely depict the consequences of the Bolshevik revolution on a “bourgeois” family, but ,apparently, not on a Jewish “bourgeois” family. Rothbard is a psychologically even more interesting case. He was ,in many ways, the favorite Jew of a number of anti-semites. This was particularly true towards the end of his life when he was closely allied with ,amongst others, Pat Buchanan and Joe Sobran. Rothbard even went so far as to endorse the gubernatorial candidacy of David Duke. In short many Jewish libertarians ,like many Jewish Marxists, experience extreme discomfort vis a vis their ethnic and religious origins. Any thoughts as to why this is so? Thanks for asking. First, let me get some stuff out of the way. Murray was not friends with any anti semites. David Duke, Joe Sobran, and Pat Buchanan do not hate Jews. They hate Jewish lobbyist groups, as they hate most other lobbyist groups that advocate spending money in places where they, Duke Sobran and Buchanan, would rather not spend it. All lobbyists hate all other lobbyists, and all libertarians should hate all lobbyists, save the liberty lobby which actually lobbies for less government. The myth that these people are anti Semites is perpetuated by ADL whiners whose incomes are in proportion to how loudly they whine about non-issues. They also hate the Israeli government. So do I, so we’re cool on that. Second I have no magical answer, but I have some suspicions. Ayn Rand didn’t hate Judaism. She hated religion and the idea of worshipping a deity in an organized way with authority figures telling you how to do it and what to think whey you do the worshipping. She actually was an Israel supporter, a position I don’t tend to vocally take. I have only read Atlas Shrugged and The Fountainhead, not We the Living, though someday I may get to it. I would simply say she was obsessed with her ideas of selfishness and objectivism and whatnot that she constantly hammered and just didn’t want to be associated with Judaism. I understand that. As for Murray, he has many a talk denouncing anti Semites, particularly Keynes. That he was the favorite Jew of a number of anti Semites only proves that those people were not anti Semitic, but only hated Jewish efforts at manipulating government for their own purposes. Murray did in fact hate the State of Israel, with a fiery passion. I’m involved in co-authoring a paper debunking his infamous “War Guilt in the Middle East” article as we speak. His hatred of the State of Israel in particular over other states is far beyond my own. I do hate the State of Israel, but not any more than any other State government. Murray had a special hatred for Israel as a State particularly. I don’t understand exactly why. I can only really answer as to why I embrace my Jewishness and libertarianism. To be a libertarian and embrace your Jewishness takes a lot of flexibility, not in terms of libertarianism which is not all that flexible, but in terms of Judaism, which is much more flexible. To encounter the economic ignorance and annoying Israel activism of mainstream Jewish people is a lot to take, and if you don’t have a flexible background in Judaism, you’ll leave it because other Jews are so off base and totally confused. I come from a background of Maimonidean rationalist yeshivishness, hard liberal modern yeshivishness, with several Haredi friends who are classical frummies. I have one main assumption about God and his plan for the Jewish people. I assume that God’s plan is to lead human history to choosing a libertarian path. My reading of Tanach supports this, as I see Abraham as the first activist libertarian as well as the first Jew. Noach was a libertarian but he wasn’t an activist. So God made a promise to Abraham that his kids would continue his philosophy. I have no evidence this promise was ever made other than the fact that Jews as a distinct entity still exist. I have no evidence that God exists or that Judaism is a definable thing with boundaries. I don’t really care if it is or not. So I am extremely flexible regarding my own Jewishness. I follow Halacha generally because I see some value in it and that’s how I grew up. Without Halacha there would be no Jews, and without Jews there would be no chance at global libertarianism. 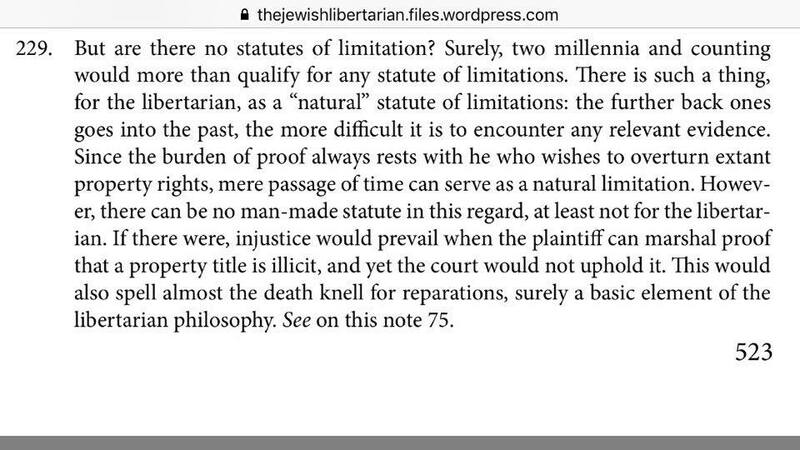 But when Halacha conflicts with libertarianism I ignore halacha assuming it is simply wrong. I am flexible enough to say that without having a major crisis of religious identity. And since I see all Jews as one family together responsible for converting the world to libertarianism, I can withstand supreme idiocy from within my own family without disowning it and becoming estranged. I see no Rabbi as above me, and look up to nobody but myself. So to be comfortable with your Jewishness as well as libertarianism, you need to be comfortable with molding Judaism into libertarianism and assuming that the former is meant to reflect the latter. My end belief is that without the Jewish people, libertarianism on a global scale would be impossible. First it’s us, then it’s the rest of the world, with the Beit HaMikdash at the center. Read my Manifesto of Torah and Faith for a further breakdown of my philosophy.